Born: 1 November 1844, Bristol, Somerset, England. Died: 20 April 1937, Melbourne, Australia. Edward J. Dunn was born at Bedminster, near Bristol, the son of a printer. In 1849 the family emigrated to New South Wales, Australia. Dunn was educated at a Church of England school in Victoria and later received some private tuition in Latin, Greek and Geometry. He was interested in geology from a young age. In 1860 he joined the Lands Survey Office in Victoria, and four years later joined the Geological Survey of the Mines Department of New South Wales. He qualified as a mine surveyor in 1869. In 1871 he was appointed government geologist of the Cape Colony, a post he filled with distinction for fifteen years. He travelled extensively and contributed to geological knowledge of the country by means of Cape of Good Hope Parliamentary Reports, numerous scientific papers, and geological maps. Dunn started his work in South Africa by spending three months on the newly discovered diamond fields around Kimberley and described his observations and conclusions in a pamphlet, Notes on the diamond fields (Cape Town, 1871). He recognised the abundance of igneous rocks, but the origin of the diamonds remained unclear and even the distinction between kimberlite and weathered dolerite was not yet recognised. In 1872 he spent some time at the School of Mines in London. Later work enabled him to recognise that the igneous rocks containing the diamonds were volcanic pipes. This view was expressed in his paper "On the mode of occurrence of diamonds in South Africa", read before the Geological Society of London in December 1873 and published in its Quarterly Journal the next year. Dunn's official reports represented only a small portion of his scientific output and all dealt with economically important geological deposits. The first, On indications of the existence of gold in certain of the western divisions of the Colony (A29-71) comprised only two pages and was submitted in the year of his arrival in South Africa. From October 1871 to February 1872 he travelled through Namaqualand and reported On the country traversed by the "Gold Prospecting Expedition" in Namaqualand (G21-72), with maps and diagrams. Little gold was found, but he studied and described the complex geology of the region, including the copper deposits, and noted the abundance of stone implements along the Orange River. Further information relating to this expedition was provided in 1873 (G31-73), together with a report on the Stormberg Coal Field. His most important work on the Stormberg beds and coal-fields was carried out in 1876-1877 and formed the subject of a comprehensive report (G4-78) which included a geological map, on six sheets, of the coal-fields. The map was the first detailed geological map of any portion of South Africa, and also the first coloured geological map to be printed in South Africa. He divided the stratified rocks into four groups: Coal measures (later named Molteno beds by A.H. Green*), Red beds, Cave sandstone, and volcanic rock - a division which has stood the test of time. Soon thereafter he announced his discovery of coal in the lower Karoo strata, and described the lower part of the Karoo Supergroup in Report on Camdeboo and Nieuwveldt coal (G37-79). In 1885 the Cape government asked him to examine the country between the Stormberg and Indwe coal-fields and to collect specimens elsewhere for the Colonial and Indian Exhibition of 1886. In the resulting Report on a supposed extensive deposit of coal underlying the central districts of the colony (G8-86) he announced his finding that the Dwyka conglomerate (tillite) extends all around the Karoo basin, and confirmed its glacial origin. After a visit to the Transvaal Dunn briefly described the rocks of the Lydenburg and other gold-fields, including an east-west section through the Lydenburg district, in "Further notes on the diamond-fields of South Africa, with observations on the gold-fields and cobalt mines of the Transvaal" (Quarterly Journal of the Geological Society, 1877). In June 1883 he delivered a further (unpublished) paper on the Transvaal gold-fields before the South African Philosophical Society. Dunn's Geological sketch map of Cape Colony was published in 1872 and was based on observations made by A.G. Bain*, A. Wyley*, T.C.J. Bain*, W.G. Atherstone*, and R. Pinchin*. Three years later he visited England and published a more extensive map, Geological sketch map of South Africa (1875), which included the Transvaal. On this map he introduced the name Dwyka Conglomerate. A revised version of this geological map was published in Melbourne in 1887 and is virtually a summary of his fifteen years of work in South Africa. His contributions to South African geology, particularly those relating to diamondiferous pipes and the succession and nature of the Karoo strata, were of great importance. He was elected a Fellow of the Geological Society of London in 1884. The next year he and W.G. Atherstone* donated a valuable collection of Namaqualand schists and many other rock samples from all over the colony to the Albany Museum. Dunn followed this up in 1886 with a selection of Bushman spear and arrow heads and rocks striated by glacial action from near the junction of the Orange and Vaal Rivers. 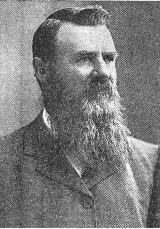 In 1886 Dunn returned to Australia "under a grievance against the Cape Government and some antagonism towards this country" (Du Toit, 1945) to practise privately as a geologist. However, he visited South Africa again in 1898-1899. A study of the Vereeniging coal-fields and the fossils found there enabled him to conclude that the beds were not of Stromberg age as was generally believed, but corresponded to the Ecca Group. His observations and conclusions were presented in "Notes on the Dwyka coal measure at Vereeniging, Transvaal", read before the South African Philosophical Society in May 1899 (Transactions, Vol. 11, pp. 67-74), and in papers published in the Transactions of the Geological Society of South Africa (1898, Vol. 4, pp. 115-116; 1899, Vol. 5, p. 61-65). He had already been elected an honorary member of the latter society. In Australia he was appointed director of the Geological Survey in the Victoria Department of Mines and Water Supply in 1904, holding this position until his retirement in 1912. Thereafter he continued in private practice for many years. In 1905 he received the Murchison Medal of the Geological Society of London for his geological work in Australia and South Africa. Dunn was interested in archaeology and ethnology, particularly in the Bushmen he encountered in the northern parts of the Cape Colony. After his first visit to Namaqualand he described some of his observations in "Through Bushmanland", in the Cape Monthly Magazine (new series, 1872, Vol. 5, pp. 374-384; 1873, Vol. 6, pp. 31-42). In March 1879 he exhibited stone implements that he had collected in various parts of the colony before the South African Philosophical Society, of which he was a member. In a subsequent paper, "Stone implements of South Africa", which was published in the society's Transactions (1880, Vol. 2, pp. 6-22), he attempted to give the first comprehensive account of South African prehistory. However, he did not describe the locations of his collection sites accurately enough for others to build on his work. He took most of his collection of archaeological and ethnological material with him when he left for Australia and continued collecting there and in New Zealand. A description of his collection was published by the Victoria Museum, Australia, in 1908. Much of the collection is now in the Pitt-Rivers Museum in Oxford. In his later years he wrote a beautifully illustrated book, The Bushman... (London, 1931, 130p), but unfortunately it takes no account of research conducted after his departure from South Africa. While in South Africa Dunn also collected plants in the Camdebo and Graaff-Reinet district. Specimens collected by him are in the Bolus Herbarium, University of Cape Town. In 1884 he collected seed from a new species of flowering plant in the eastern Transvaal. It was grown at Kew Gardens and named Streptocarpus dunnii in his honour. During his long geological career Dunn collected a large number of pebbles. Some 700 of these were discussed in his book, Pebbles, published in 1911. In 1934 he donated this collection to the British Museum (Natural History). Another noteworthy book by him was The geology of gold (London, 1929, 303p), dealing with the gold deposits of South Africa, Australia and New Zealand. In 1918 he wrote an "Early history of the South African diamond fields" for the London Mining Magazine, based mainly on his own experiences. He was a prolific writer, producing more than 200 publications. In July 1875, while in Britain, Dunn married Elizabeth Julia Perchard, with whom he had a son and two daughters. Australian dictionary of biography, Vol. 8, 1981. Melbourne University Press. Cape of Good Hope. Report of the committee of the Albany Museum, 1885, 1886. Cape of Good Hope. Report on the Stormberg coal-fields (1878), Report on Camdeboo and Nieuwveldt coals (1879), Report on the occurrence of gold in the Knysna district (1880), Report upon recent coal-borings in the Camdeboo and Stormberg (1883), and Report on a supposed extensive deposit of coal underlying the central districts of the colony (1886), by E.J. Dunn. Corstrorphine, G. Presidential address: The history of stratigraphical investigation in South Africa. Report of the South African Association for the Advancement of Science, 1904, pp. 145-181. Council for Geoscience. Catalogue of publications of the Geological Survey and government publications dealing with earth sciences (compiled by R.R.M. Price). Pretoria, 1997. Du Toit, A.L. Edward John Dunn, FGS, 1844-1937. Proceedings of the Geological Society of South Africa, 1938, Vol. 41, pp. xlv-xlvi. From our archivist: Government geologists of the Cape of Good Hope. Geobulletin, 1991, Vol. 34(1), pp. 39-40 (by G. Levin). Geological Society of South Africa. Transactions, 1897, Vol. 2; 1898, Vol. 4; 1899, Vol. 5; 1906, Vol. 10: Dunn's papers, and lists of members. National Automated Archival Information Retrieval System (NAAIRS). http://www.national.archives.gov.za/naairs.htm Documents relating to Edward John Dunn / E.J. Dunn. South African Committee for Stratigraphy (SACS). Stratigraphy of South Africa. Part 1: Lithostratigraphy... (Compiled by L.E. Kent). Pretoria: Geological Survey, Handbook 8, 1980, pp. 211, 455. South African Philosophical Society. Transactions, 1877-1883, Vol. 1-3; 1900, Vol. 11: Proceedings, Dunn's papers, and lists of members.